There's a new project underway.... well, actually it is finished and I'll be showing photos soon, but in the meantime wanted to share a few tatted 'doodles' that I made. 'I Spy'..... butterflies, flowers, leaves, a dog, a green turtle, a rabbit and a little white cat. I'm incorporating a few of these into a new quilted project. A sneak peek at the planning stage here. Hard to choose which to use. 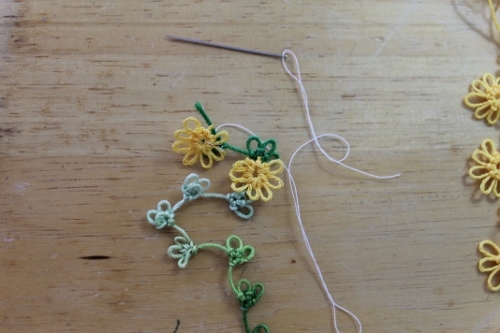 As it seems with most my projects, almost all my tatting has been given away, other than these simple 'doodles'. 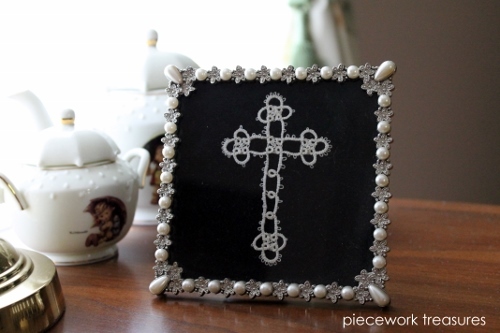 While visiting my mother-in-law I took the opportunity to snap a photo of this lovely cross I made her a few years ago. I mounted it on a piece of black velvet and framed it in a pearl frame. Actually, it sticks to the black velvet quite nicely and the pressure of the glass of the frame keeps it all in place. 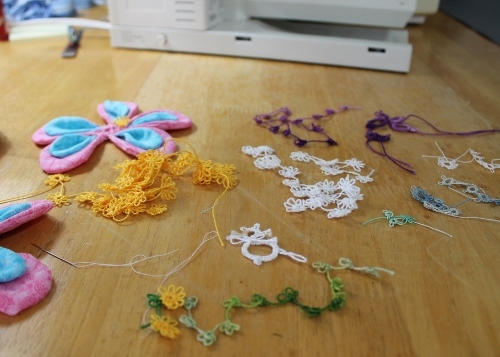 All these designs came from the wonderful book The Complete Book of Tatting by Rebecca Jones. I did not realize until writing this post today, this book is considered the 'bible' of tatting. 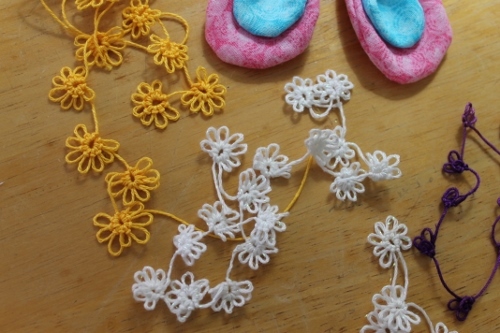 The author explains different tatting methods and includes many patterns. 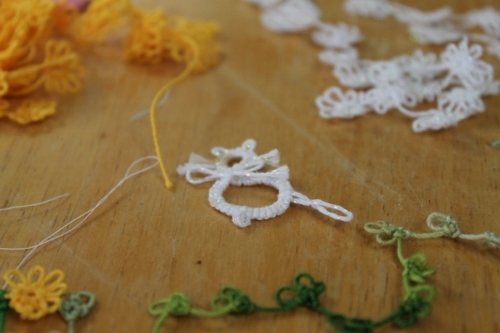 It's also a good idea to have someone to guide you when learning tatting, as there is a little trick to flipping the knot. I was fortunate that an elderly neighbor took the time to teach me..... a LOT of time to teach me!!! 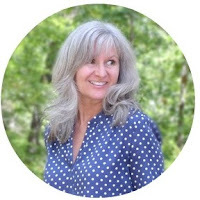 There was simple joy in spending time with her as she was housebound caring for her ailing husband, so we all visited together while she patiently helped me flip my knot(s). 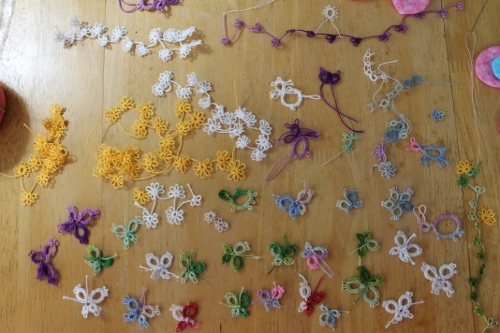 Most of my tatting was done in the early 2000's and I hope to pick up a shuttle again soon. What a lovely, colorful bunch of tatted doodles! The mind races when thinking what one could do with them. I'm eager to see the quilt you're going to use them on. I don't think there are very many people who know how to tat these days. It's a dying art for sure, but looks as if we can count on you to keep it alive and well. Has Carolina Girl expressed any interest in learning how to do it? Gotta keep the talent going! You are right in that there doesn't seem too many people 'round who seem to know how to tat. That's a good question about Carolina Girl because actually she has never expressed any interest in tatting. Maybe when she gets older she might. Gosh, I'm really glad you brought up this point, as I really should try to teach her, as she might never know anyone else. She does knit and crochet beautifully. Thanks so much Mama Pea for giving me something to think about. 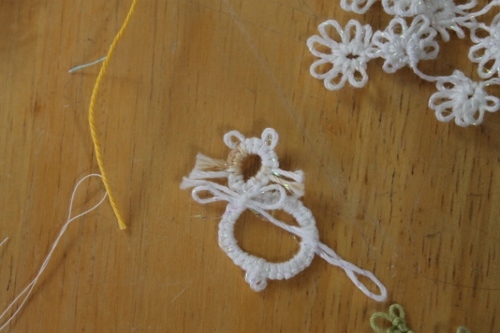 I self taught myself how to tat twenty years ago then left off after five or six years of making lace. Recently, I've picked it back up and I am astonished at how much is available now. I'm using doodles to learn the new techniques so I appreciate bloggers like you who share them. Thanks!